Big Sister products are now in selected IGA stores across Australia. Madeira in store this week! 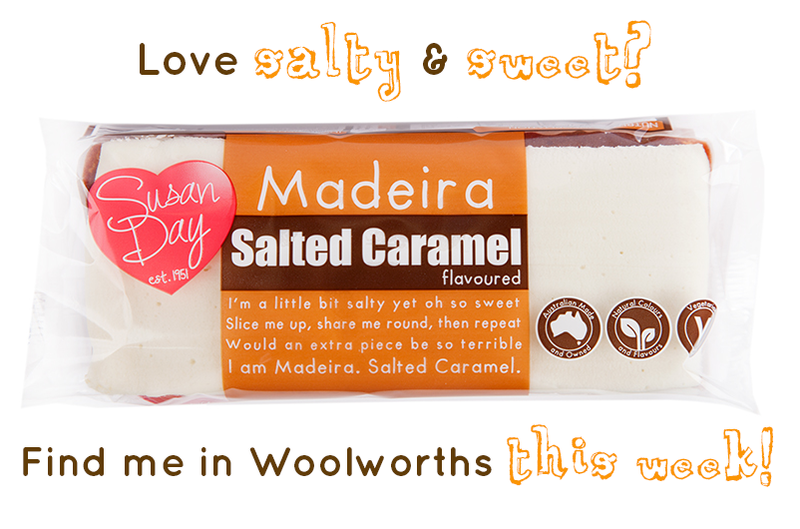 Two of our favourite madeira cakes are back in Woolworths this week. Salted Caramel and Raspberry with White Choc are both in store for a limited time so hurry in before they're all sold! St Kilda Football Club is pleased to announce that national cake manufacturer Susan Day Group has signed on as an Elite Partner for 2015. The partnership will see the Susan Day cakes’ logo feature on the players’ match-day shorts and media backdrop. The organisation’s Big Sister cakes logo will also feature on other club assets including LED signage at home games. St Kilda CEO, Matt Finnis, said signing another industry leader sends a positive message to the football community that the club is heading in the right direction. “As one of the largest manufacturers of packaged cakes in the country we are thrilled to welcome the Susan Day Group as an Elite Partner,” he said. “Successful organisations have a strong sense of belief and the Susan Day Group has people-first values and is committed to celebrating personal strength, confidence and growth which aligns perfectly with the St Kilda spirit of How I Want To Be. Allan Rich, Executive Chairman Susan Day Group, said the organisation was excited to be partnering with the St Kilda Football Club. “Just like the AFL, Susan Day and many of its products are also uniquely Australian,” he said. Today’s announcement follows the recent signings of Dare Ice Coffee (Principal Partner) and SEEK (Elite Partner) and is the latest in a raft of positive announcements from the club. To celebrate Coeliac Week we have launched Gluten Free Lamingtons into IGA Supermarkets. With all the taste and temptation of our regular Lamingtons, these gluten free ones will satisfy any sweet tooth or afternoon craving. To learn more about Coeliac Week head to www.coeliac.org.au. NEW Double Choc Lamington in store now! Rush into Coles this week and try our NEW Double Choc Lamingtons! They are a double hit of chocolate and are so delicious you'll be running back for more. Hurry in so you don't miss out! Guess what's coming to Coles...? If you love chocolate and you love cake then just wait till you see what's hitting Coles this week!! Stay tuned! WIN a Myer Gift Card! With Mother’s Day approaching we gave thought to what sort of cake best represents a mum. Is she a Lamington....a Sponge Roll perhaps? No...we’ve decided that a mum is most like a madeira cake. She has a heart of gold, is a bit of a softie and knows how to bring people together. All in all she is simply lovely...just like our popular madeira cake. Tell us why your mum is lovely and be in with the chance to win 1 of 3 $50 Myer Gift Cards. Enter via Facebook.